Cue old Kanye: "Shiiiiii... they say the best things in life are freeeee!" Now I don't ask much for Christmas, mainly because receiving gifts makes me kind of nauseous. I hate all eyes on me while I open a box of uncertainty. So this year I asked my mom to just make me all my favorites, and she did just that. Thank ya LAWD for Mrs. Alexander and the total 5 plates I ate. But another touching gift was the one I received from my mother-in-love. I previously had expressed my obsession with brooches on a previous shopping trip we embarked on. So of course it was only right for her to capitalize from this obsession and send me brooches for Christmas. But what made these brooches beyond special was that they were hers, her mother's, and her great grandmother's. How much thought and love could someone show by giving you something that has been in their family for generations! I felt so honored to be entrusted. I was nervous at first, (we all know what happened the last time I was entrusted with family jewelry). SMDH! But her selfless and thoughtful gift and their beauty quickly deterred this thought. Besides, I have a few tricks up my sleeve with hidin' my ish now! Lol. 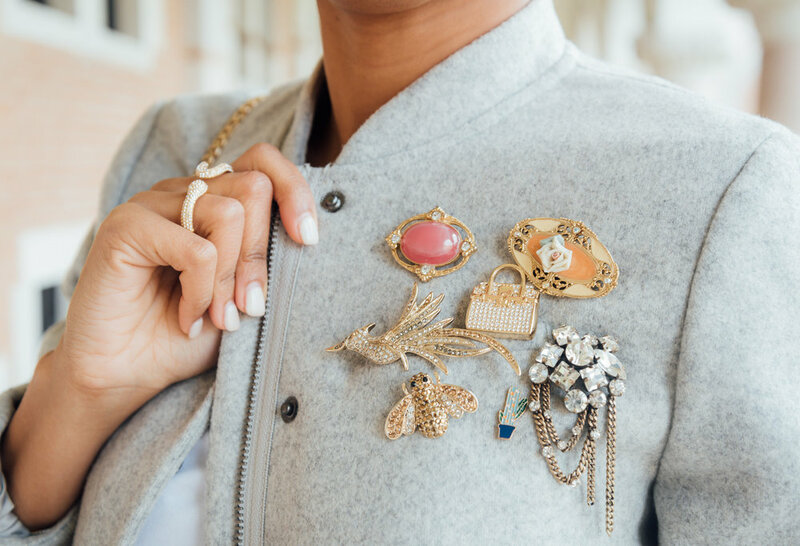 So this weekend I HAD to style these brooches. The top two in pink are just two of the ones she gave me. Aren't they GAWJEUS?!?!? I didn't want to style them all at once, for fear of losing them, but I can't wait to style the rest of them and show you all their timeless beauty! The others are listed below! I paired the timeless brooches with timeless choices, like this Grey bomber sweater with relaxed, almost flared sleeves and this flared midi skirt. Did anyone else receive priceless and timeless family heirlooms this Christmas? Let me know if you did! It makes my heart melt hearing about these stories. Be whether you have a capsule of timeless love or you got the latest bit from technology, I hope you all had a FABO Christmas! Talk to you in the new year!